I really like the "Rabite" from the snes RPG "Secret of Mana". 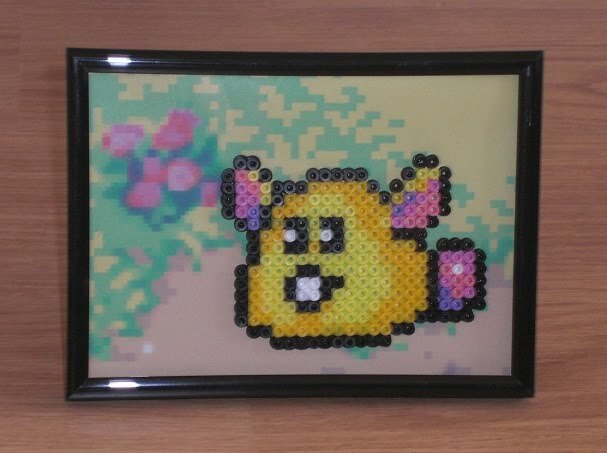 Just bought some hama beads so I decided to create a cute little rabite. I made a background in paint and framed the whole thing. Kawaii!!!! Thanks for your comment and suggestion! I'm trying that technique at the moment, it looks great for re-creating sprites with crochet! Would love it if I can do that too. Need to get the hang of it, the color transitions aren't going that well (yet). Maybe I can find a good video that shows how to do that on youtube..
And as I couldn't find any tunasian hooks here, I made one from a knitting needle (carved the point), but it needs some work as well.